When John Hill created a poster for the Black Sabbath concert at The Rave in 1994, he never imagined he would see it and other illustrations he drew in an art gallery 20 years later. “It’s cool. It brings back a lot of memories,” said Hill, who drew posters and album covers for rock bands in the 1990s and now is a tattoo artist. Hill’s illustrations are on display at a new exhibit at the Walker’s Point Center for the Arts (WPCA). The exhibit, “The Art of Music in Milwaukee,” features concert posters, album covers, photos and other art pieces, all with a connection to music and Milwaukee. “We have everything from jazz music portraits to heavy rock to metal to ‘Alverno Presents’ concerts … so it’s a pretty rich selection of material,” said curator and WPCA board member Michael Flanagan. Flanagan organized the exhibit, which includes work from more than 20 Milwaukee-area artists. “I started thinking about people I knew who were fine artists who used music as a motif for the things that they did,” he explained. 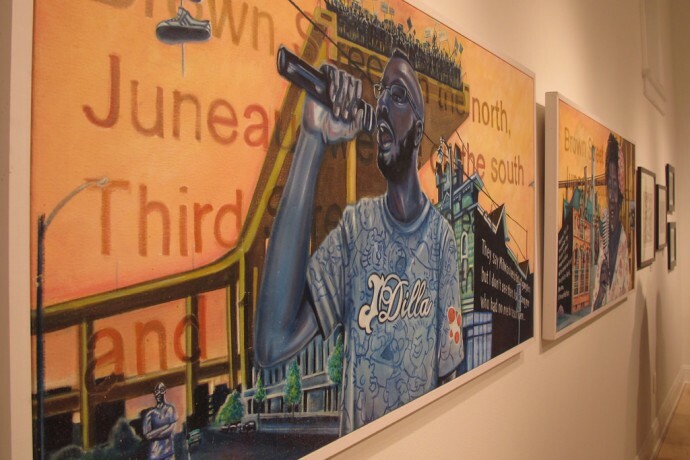 Mutope J. Johnson, a recent graduate of the UWM Peck School of the Arts,contributed two of a series of eight paintings from his Bronzeville Poet Series. “I did a collaboration with a number of poets and performers and writers from Milwaukee,” Johnson said. 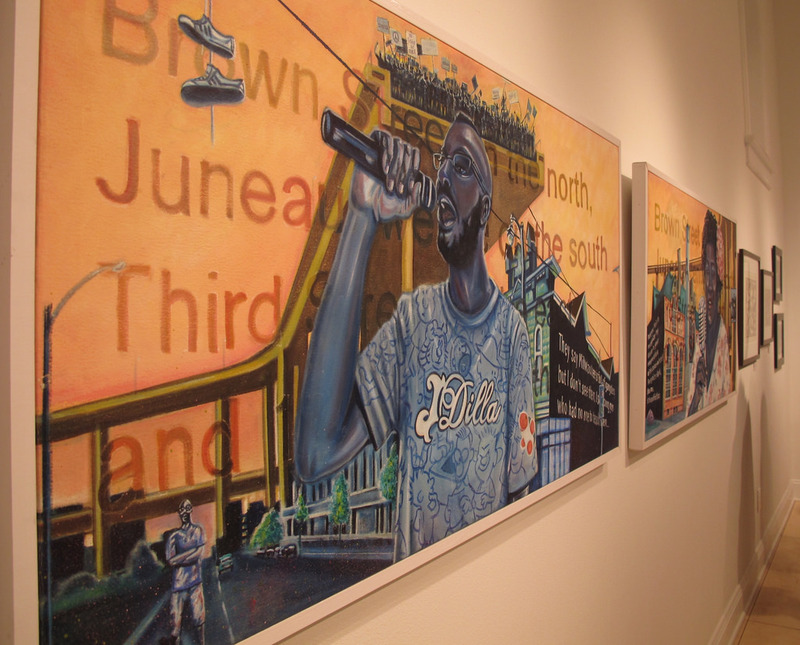 His paintings of poet and MC Mikal Floyd-Pruitt and poet Tiffany Miller are on display in the exhibit. Christopher McIntyre‘s print, “Brady Blues” is also on display. The photo, from 2009, shows a man with a saxophone walking down the street at the corner of Brady and Farwell streets. “He’s just walking the streets with his saxophone. I don’t know his story, but it just struck a chord with me,” McIntyre said. The exhibit also includes two “artist palettes,” an instrument Hal Rammel invented in 1991 and builds. An artist palette has a wood base and is mounted with vertical wooden and metal rods. “They are amplified with a small microphone attached to the back. They’re played with a bow or with mallets. Amplified, they sound very much like a thumb piano or a bass marimba,” Rammel said. Rammel improvises and composes his own music for the instrument. “If I build an instrument that is not designed in the manner of conventional instruments then it is my responsibility to find the music in that instrument and not to make it play music that already exists,” he said. 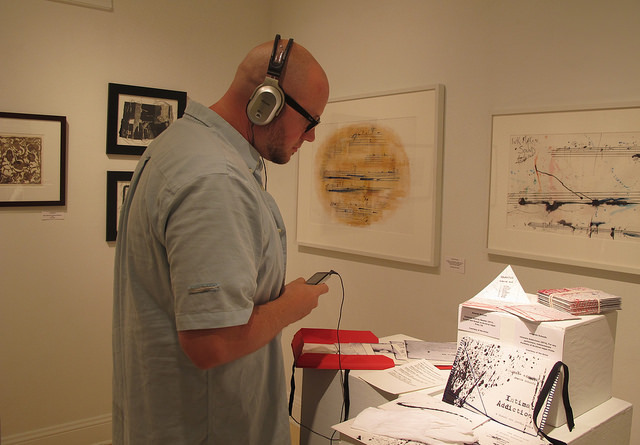 Rammel will perform his music at a concert held in conjunction with the exhibit on July 11. Artist and musician Amanda Schoofs is also scheduled to perform, and music portrayed in artist Paul Mitchell’s work will be played. The exhibit runs through July 12. The gallery is open Tuesday through Saturday from noon to 5 p.m.
Nice job on reviewing the exhibit Brittany, I appreciate the time you took to speak with so many of our artists and visitors in the gallery. If I might add a bit to the review, I’d like to thank everyone who gave me suggestions about artists, musicians and graphic designers that eventually were included in the exhibit. I certainly did not know everyone right from the start; the exhibit continued to expand through the planning process and some wonderful additions to the show came in as a result of the collaborative effort. The level of professionalism, inventiveness and cooperation was fantastic.